When your computer collapsed and you need to reinstall all software, how to restore your product keys(CD Keys) or serial number for installed software? Such as Windows Operating system, Word, Excel etc. Do I need to buy the product key again? 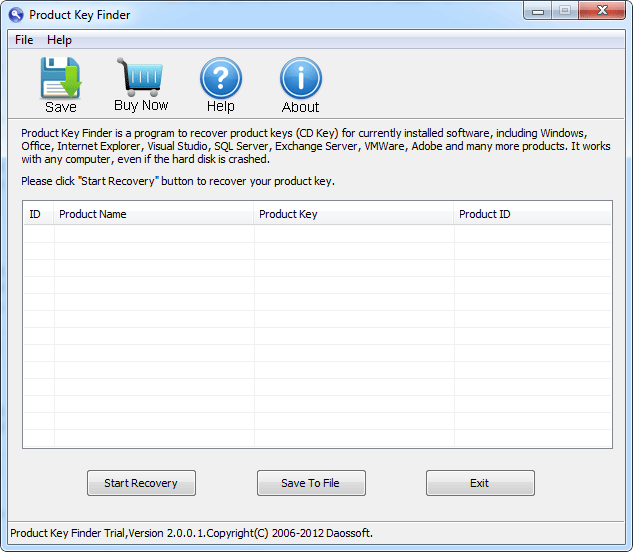 Don't worry, Product Key Finder can help you recover any software's product keys(CD Keys) or serial number. Just one click, all product key and serials number of software you have installed ever will be listed, including Windows, Office, Internet Explorer, Visual Studio, SQL Server, Exchange Server, VMWare, Adobe and many more products. 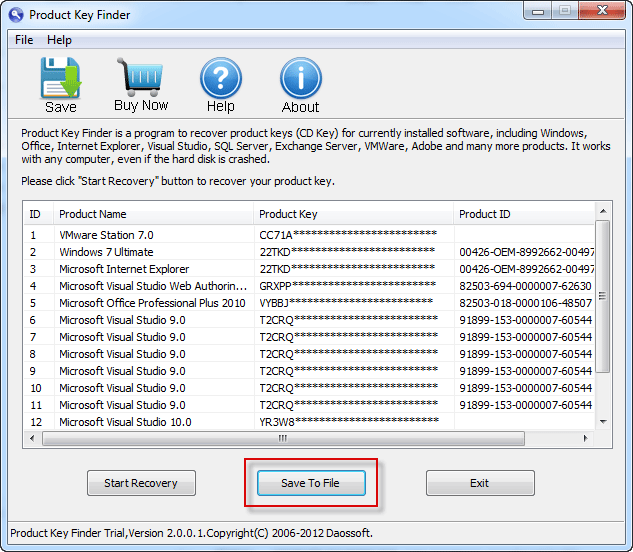 This tutorial will instruct you how to use Product Key Finder to complete this task. It is very simple. Step1. Install Product Key Finder on your computer which your software were installed on. Step2. Find all product key and serials number on the computer. 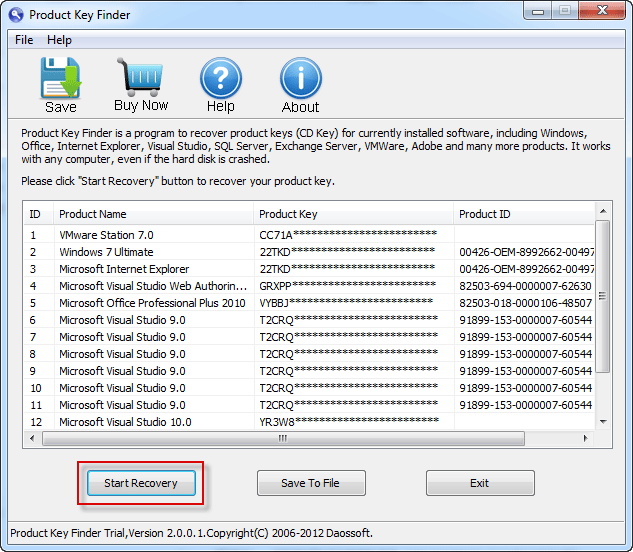 Click on the "Start Recovery" button, and the program will find out all product keys from currently installed software automatically. Such as Windows, Office, SQL Server, Exchange Server, Visual Studio, VMWare, Adobe and many other products. 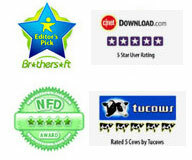 Note: Product Key Finder Free Trial Version only displays the first 5 characters of product key. You can back up these product key by simply click "Save To File" button then it will backup your recovered product keys to a secure location. Reset local administrator and other user's password for windows 7, Vista, XP, 2000 without data lost. All you need is a bootable CD/USB. Windows 10/8.1/8/7/Vista/XP, Windows Server 2019/2016/2008/2003/2000 etc.